I remember seeing this film in theaters when it first came out and being completely swept away by its stark, simple beauty. It’s a film that is unrelenting from the beginning and doesn’t let up until the credits role. While Philip Seymour Hoffman is really the center of the film in a powerhouse performance as Truman Capote, it’s a wonderful ensemble filled with some of the greatest working character actors of modern cinema. It was nominated for five Oscars, winning one: Best Adapted Screenplay, Best Supporting Actress Catherine Keener, Best Actor Philip Seymour Hoffman (won), Best Director and Best Picture. It was up against Brokeback Mountain, Good Night, and Good Luck., Munich and winner Crash. As much as I liked Crash, I think of these five films Capote is my favorite. It’s just so wonderfully acted, written, directed and film. Adam Kimmel’s cinematography is just breathtaking, how it wasn’t nominated for an Oscar is beyond me. 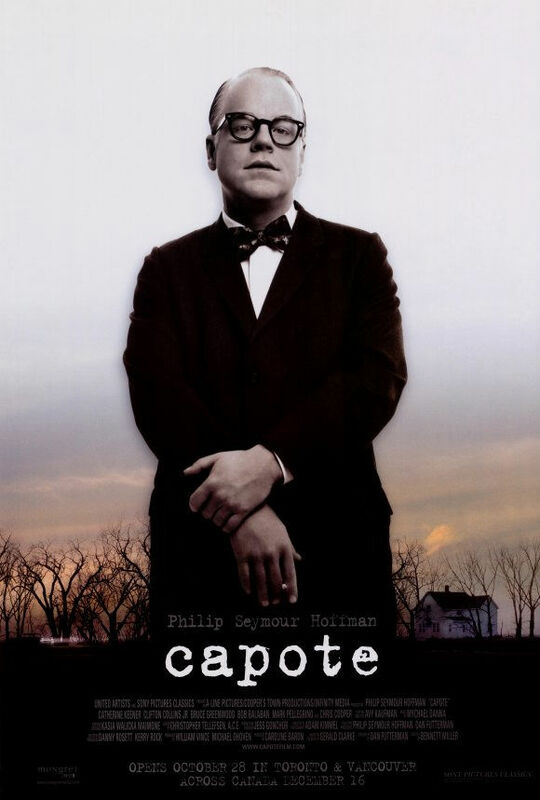 Philip Seymour Hoffman transforms into Truman Capote, giving one of my all time favorite performances. It’s not a subtle performance, but it is incredibly nuanced and layered. My favorite scenes are those intimate moments between him and killer Perry. It must have been difficult choosing between this performance and Heath Ledger in Brokeback Mountain and David Strathairn in Good Night, And Good Luck. but in the end I’m glad the Academy went with Hoffman. Like I said earlier, I love the scenes between Capote and Perry, played to perfection by Clifton Collins, jr. I really thought he’d get a Supporting Actor nomination for his performance. I think I’m still a little bummed that he didn’t. I used to not like Catherine Keener and then I saw this film and my opinion of her changed completely. Her Nelle Harper Lee is the perfect straight man to Hoffman’s impish Capote. She’s his rock and her performance so perfectly compliments his. Although she lost to Rachel Weisz’s powerful performance in The Constant Gardener, I’m glad at least she was able to pull off a supporting Oscar nomination. Chris Cooper is Hollywood’s go-to guy when you need a tough as nails blue-collar type guy. He may play this archetype often, but he brings something new to each character he plays and he’s definitely at the top of his game in this film. Bruce Greenwood gives a wonderful, if brief, performance as Capote’s long-term companion and fellow writer Jack Dunphy. Much like Keener’s Harper Lee, the film portrays him as a supporting character in the story of Capote’s life, one that is only there to keep loneliness at bay. Something tells me, that’s kind of how the real Capote saw them as well. If you’re interested in purchasing the film, you can do so here. Posted on December 27, 2010, in Oscar Vault Monday and tagged 2005, Adam Kimmel, Bennett Miller, Bruce Greenwood, Capote, Catherine Keener, Chris Cooper, Clifton Collins Jr., Oscar Vault Monday, Philip Seymour Hoffman. Bookmark the permalink. 3 Comments. Great film. I used to love to see Capote on talk shows he was so entertaining. this was certainly a good movie. i was finally turned around by keener like i hadn’t ever been before. but i really liked harper Lee anyway. now this is how you do a murder mystery biopic.